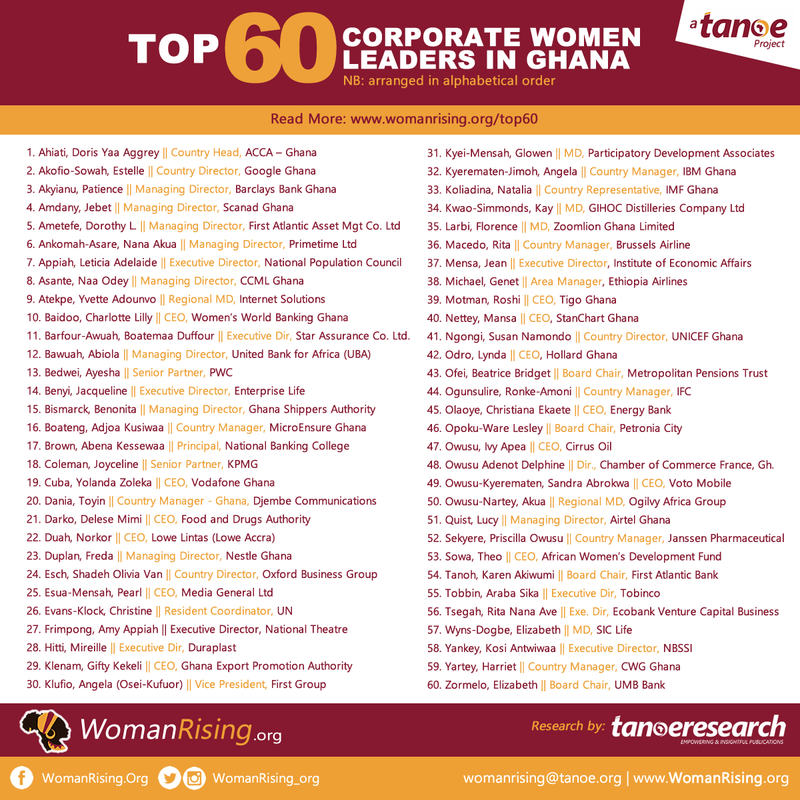 The African Network of Entrepreneurs (TANOE), through its flagship network, WomanRising has announced its 2017 WomanRising Top 60 Women Corporate Leaders in Ghana list. 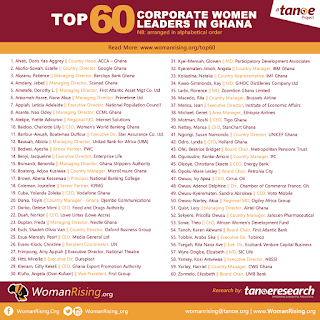 The list which features women heading various outstanding organisations in the country was compiled by TANOE Research and follows TANOE's previous publication on the WomanRising Top 50 Corporate Women Leaders in Ghana in 2016, which received tremendous public recommendation globally. (www.womanrising.org/top50). In a statement by Ekow Mensah, CEO of TANOE, he mentioned, "As Ghana celebrates her sixty years of independence, we at TANOE find it prudent to celebrate 60 of the most outstanding, inspiring and hardworking corporate women leaders in Ghana. These exceptional women work their hearts out daily to contribute immensely to the economic development of Ghana. Celebrating Ghana without celebrating them will be an unpardonable error. We are proud of these 60 women business leaders and we believe their exploits and stories will inspire the next generation of women business leaders not only for Ghana but for Africa and the rest of the world." The women will be receiving their awards at the upcoming 2017 Women CEOs Summit slated for 19th October at the Movenpick Ambassador Hotel in Accra. Barfour-Awuah, Boatemaa Duffour || Executive Dir, Star Assurance Company Ltd.